Stakes from 5 – 500. Live 3 Card Brag is a relatively new game to transition to Live Casinos. For regular players, it won’t look too dissimilar to Live 3 Card Poker, but it has a much older history. The game itself has been around in the UK since the 16th Century. The game is another derivation of poker, and rather than being played with 5 cards in a hand it’s played with three cards. 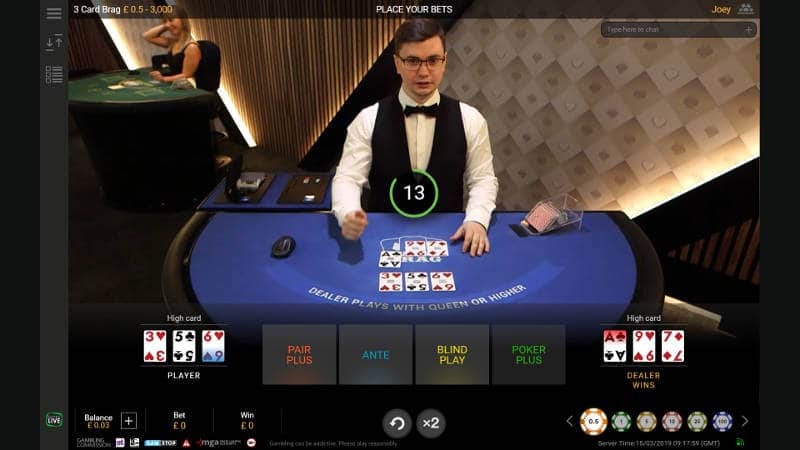 Traditionally 3 Card Brag is played against other players with one acting as the dealer, but the online Live version has just two hands. One for the player and one for the dealer. The object of the game is for the player to beat the dealer with a higher valued hand. Live 3 Card Brag is only available at Playtech Live Casinos. It’s their alternative to Evolution Gamings 3 Card Poker. The Return to the Player (RTP) of 3 Card Brag is 98.00% for the Ante Bet and 97.86% for the Pair Plus Side Bet. Three Card Poker has an RTP of 96.63% for the Ante bet and 95.51% for the Pair Plus bet. So you can see that 3 Card Brag is the better game. This has a lot to do with the differences in the hand order between the two games. Lower value hands in 3 Card Brag are rewarded higher than in 3 Card Poker. Currently, Betfair has the best stake ranges. You can play for as little as a £1 a hand up to a maximum of £1,000. The objective of 3 Card Brag is to beat the dealer’s hand with a better hand than he has. The game is played with one deck of 52 Playing cards that is shuffled before each new hand is played. The hand values in Live 3 Card Brag are not the same as in poker. The hands look the same, but the order of value is different. For example, there is no Royal Flush. The top hand in 3 card brag is a Prial or 3 of a Kind. In the offline version of the game, the top Prial you can get is 3 Threes, 3-3-3. This is the lowest value hand. An Ace is valued high for this. Two cards of the same value. In a standoff, a higher pair would win. Three cards of the same suit. In the event of a tie, the high card rule applies. 3 cards from any suit making a run or straight. 3 cards from the same suit making a run or straight. 3 cards of the same value. The strategy for playing the game is the same as used for 3 card poker. If you have a hand that is equal or higher than Queen, Six, Four you should play the hand. Anything less you should fold. With the live version of the 3 card brag the first action by the player is to make a bet. The Ante – A bet placed to signify that you want to play the hand. In most games, this is a compulsory bet that you have to play. In 3 Card Brag, it’s optional as long as you’re playing the side bet Pair Plus. Placing this bet qualifies for an Ante Bonus payout, which gets paid for specific hand values even if the dealer wins the hand. See the table below for more info. Pair Plus Side Bet – This bet pays enhanced odds for a player hand that contains a pair or more. It’s only paid out if the player hand has a pair or more as is paid even if the dealer has a better hand. You don’t have to play the Ante Bet to be able to play this. Normal playing convention, however, sees most players placing the Ante bet and a Pair Plus bet. Once the bets have been placed the dealer will deal three card face up to the player position on the table and three down to the dealer position. The player then needs to decide whether to play or fold the hand. If you decide to play and you’ve placed the Ante Bet you’ll need to place a PLAY bet equal to the amount of the Ante bet. If you’ve only played the Pair Plus side bet you don’t have to do anything, the bet is in play until the final reckoning with the dealer’s hand. Folding the hand results in you losing your Ante Bet and Pair Plus bet. The dealer then turns over his three cards and they are compared to the player’s hand. The dealer needs to have a Queen or higher in his hand to qualify to play. He hasn’t – the player is paid equal money on his Ante bet and the Play Bet is returned to him as a PUSH. If the dealer qualifies and has a better hand than the player, the Ante and Play bets are lost unless the hand qualifies for an Ante Bonus payout. If the player beats the dealer’s hand the Ante and Play bets are paid at 1:1, unless the hand qualifies for the Ante Bonus payout, in which case the player will get that instead. The Pair Plus bet is then settled. This is paid if the player has a Pair or more in his hand. If he doesn’t the Pair Plus bet is lost. That’s it. A simple and easy to understand card game. The return to player (RTP) for the main hand Ante Bet is 98.00% and 97.86% for the Pair Plus Side Bet.